The world of sport has taken a long time to learn how to train big men. In the boxing world at the turn of the century James J. Jeffries (USA) at 215-225 lb was the largest world champion until Sonny Liston (USA) came in at 215-220. This is not counting two giants. One was Great White Hope Jess Willard (USA) who at 6'6" and 230-245 lb finally ended the reign of Jack Johnson (USA). He had little going for him except the ability to take a lot of punishment. There was also Primo Carnera (ITA) who was 6'5 1/2" and 260-270 with a clean waste but no talent except for his gangster connections. Max Baer at 6'3" and 210 was considered a near giant. Anyone over 225 was considered a freak and not taken seriously. However, after Sonny Liston they started growing. Ali went 210-238. George Foreman was big in his first career and even bigger in his second. Many heavies of the 1980s were a bit on the soft side as trainers realized that it was easier to win with an early KO that to plan on doing a full 15 rounds. After that they seem to get bigger to the point where today Lennox Lewis from Jamaica, Kitchener ON and London, England at 6'5" and 250 is considered large but not freakishly large. It is coming to a point where one will now have to be a minimum of 225 lb to win a World title while many contenders now routinely scale 240 or more. This has been recognized by the move to add a super cruiserweight class (190 to 210 lb). Also consider football. I remember when 220 or 230 was big for a lineman at least in the Canadian league. But now even the defensive backs sometimes weigh that much. Ditto hockey. Gordie how was considered big at 6' and 200. Defenseman Moose Vasko was the biggest man in the league at 6'3" and 215. Today he would be too small to get drafted, even as a forward. Now lets get back to our sport. 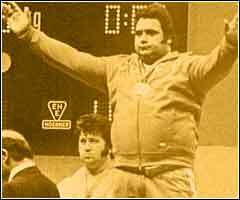 Steve Stanko (USA) was the first man over 1000 lb but was forced to the sidelines with phlebitis while in his prime. He was about 6' and was muscular enough to win Mr. America. He would have undoubtedly done more but we will never know. John Davis (USA) scaled only 5'8" and weighed 180-230. He would arguably have been one of the greatest 90 kg lifters if that category had existed in the 1940s. Jakob Kutsenko (URS) was a bit taller but could not defeat the Americans. At the same time Umberto Selvetti (ARG), Franz Hobl (AUT), and Eino Makinen (FIN) were big men. All over 120 kg. But none save perhaps Makinen was very athletic. Big men were over six feet in height were stiff and overweight like the old beer garden lifters, tall and too thin or if they were muscular it was the wrong kind of muscle. That built by bodybuilding was insufficient for its mass while that built with powerlifting movements did not perform well on speed-strength properties (despite the name). This situation was what enabled the Davis to win seven heavyweight world titles. Remember that back then a heavyweight was anyone over 82.5 kg (90 kg after 1952). The conventional wisdom then was that a lifter could be too big. The idea that size equalled slowness infected even weightlifting minds then. Someone even argued against the introduction of the 90 kg category by claiming that size did not help a lifter. But then along came two monsters that blew that thinking to smithereens. Doug Hepburn (CAN) and Paul Anderson (USA) were more muscular than anyone seen previously. They were the first train with higher intensities to try lifting as much as possible in the assistance exercises so as to gain great size and even greater strength. They succeeded and revolutionized training, especially for big men. The horsepower race, so prominent in the auto world of the time, also got underway in WL. After these two anyone hoping to succeed would have to be big, preferably bigger than the last record holder. At the same time Norbert Schemanski (USA) moved up from the 90s and took several world records at 102 kg. Anderson's all too brief reign was followed by two years of the recently deceased Alexei Medvedev (URS). Medvedev was not of imposing stature or talent, and neither were any of his opponents. He would however go on to become one of the great coaches and researchers in our sport. Yuri Vlasov (URS) was next. He was over six feet and very muscular (120 to 138 kg) but his technique was still a bit crude when compared to his lighter teammates. It was smoother than Andy's but not by much. He did though, train like a lighter lifter. No easy routines for him. Next to Alexeev, he added more to the records than any other super. Big men were no longer freaks, they were just extensions of those in lower categories. It is worth noting that Schemanski gained still more weight so that he could keep up with Vlasov. The one time quick lift specialist would end his career as a great presser. Leonid Zhabotinski (URS) was even taller (reports vary from 6'3" to 6'5") and heavier (150 to 165 kg) although a significant part of that hung over his belt. Despite that he would display some of the best technique that any super would ever show. This though was not appreciated at the time. His trademark was an exaggerated for its time "S" pull. Coaching mavens at the time never tired of stating that "the shortest distance between two points is a straight line". This was all well and good in geometry class, but not so in the biomechanics of a body extending itself through several joints. Tommy Kono and Dave Webster did much to show the folly of this reasoning so that today all pull like "Zhabo". David Willoughby estimated his functional weight to have been 125 kg. At this time Joe Dube (USA) was another big man who, like Anderson was very fast. George Pickett (USA) was very tall and also set world records at 145 kg. But Bob Bednarski (USA) did the same at only 112 kg. After that Vasily Alexeev (6'2" and 137 to 177 kg) dominated. His technique was flawless despite having even more belly than Zhabo. Also at this time most supers were large and muscular but with good flexibility and technique. Alexeev could not relax since many were waiting in the wings. This all showed that size and height will work for anyone if sped-strength and technique is not compromised. No "whale" without these qualities could win again since the sport world had learned that size did matter and that proper weight training could make it all happen. It was true in other sports and it was true on the platform as well.